February | 2014 | Extollagy! Of course, Germany is one of the most prosperous, liberal and democratic countries in the world; it is also, for this Englishman, one of the least foreign. There is no shortage of writing about its wartime experience, and no shortage there of impressive attempts to come to terms with it. My interest, however, is in landscapes, places, and my encounter with them. And I carry with me a cliché-like ragbag of images which give echoes to things that are of course quite natural: endless wintry plains of birch woods, concrete railway sidings, Achtung! in Gothic lettering. And I’m not alone in that. More to the point, the Germans aren’t, either. The people I am with are in their 70s and 80s and it was a major feature in their lives, coming up quickly in conversation. And equally quickly it becomes clear that these are memories of trauma that has left deep scars, and which — because of Nazi responsibility for the Holocaust, and the stoicism of the culture itself — go so largely unremarked that it is easy to forget. These are people who lived in cities reduced to rubble, who knew famine, who were repeatedly dislocated, who had relatives who met their deaths in distressing ways: all in the forgotten years from 1944 into the late 40s. Not only that, but they carry with them memories of another Europe. A Europe where entities like the Habsburgs and the Austro-Hungarian empire are still a living, shaping force; a Europe where England and Germany have the deepest of links, where there are huge German communities outside Germany itself; a Europe in which a rich and sophisticated Jewish culture is also a major force. It is that knowledge which humanizes the shock I experienced in trying to find some good medieval churches to check out in Germany. Hamburg. 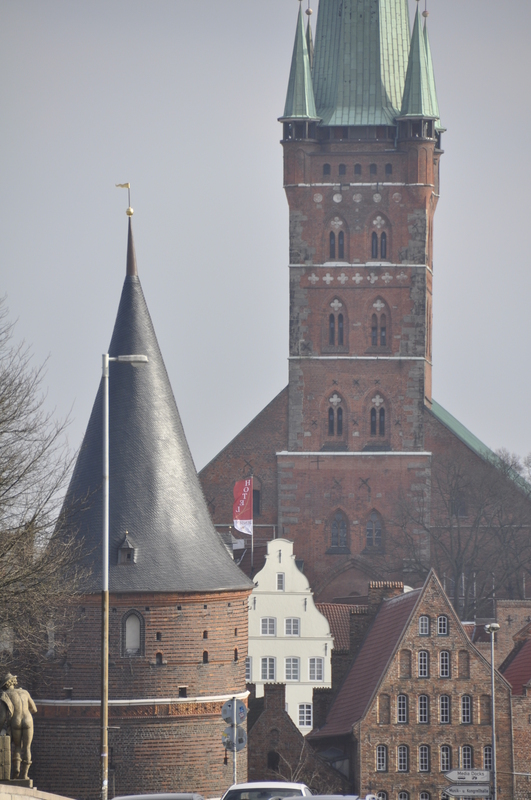 Lübeck. Osnabrück. Munster. Each major old settlement I identify as worth visiting, turns out not to be old at all: to be a recreation, put back after the war — in some cases only in the last few decades — so that the place looks as if the war never happened. In some vague way, and of course consciously I knew different but had never really digested it, I’d thought of the two experiences as comparable: both sides lost historic cities. But it doesn’t compare. Plymouth, Coventry, Exeter, part of Bristol, the east end of London: these are serious matters. But they are not the equivalent of two multinational war machines — the Allies to the west, the Russians to the east — working their way across the each side of your country respectively, bombing and fighting until they reach its capital. What happens is that whole swathes of that country are flattened. The experiences, then, of the population will make evacuation and rationing seem like a Dad’s-Army style tea party. The Blitz in Britain was terrible, of course, but this is the Blitz several times over. Walking around these cities is a disconcerting experience. They look lovely. They lack the ripping up of historic patterns which happened in England. I should be delighted: after all, if there was now a dual carriageway and a shopping centre sweeping past the Marienkirche in Lübeck, and its studded skyline was masked by Brutalist car parks, I’d be the first to moan. But these places are new. There is no patina. For someone like me, the churches in particular are a confusion of fascinating and impressive new sidelines on medieval architecture, and a complete impossibility of knowing what is real, what can be trusted. In other words, in this great rebuilding, the past was put back, but the archaeology, the layering, was taken away. Which means that that gap — between the previous building, the previous Germany, and the current one becomes a kind of enormous forgetting, an architectural oblivion, a statement something never happened. And yet everyone is living in these forged landscapes of continuity. I sometimes even wonder if their bright, tasteful homes are not themselves part of the forgetting, as if one needs space, colour and the aesthetic more if one has been through that: I’m reminded of how the most saccharine music was the most popular in China during the 1980s, when the country was waking up for twenty years of cultural trauma and oppression. Incidentally, one of the greatest discoveries of my visit was that Germany did not have an iconoclasm, and its churches, while the old ones are as in England largely Protestant, are full of objects any one of which would be a treasure beyond compare in my country. I am told, even, that the biggest losses where during the war (rather than as a result of Protestant image-destruction) and that what survives is the result of canny storage of artworks elsewhere before the Allied bombs began to fall. Much else did not escape. So weirdly, we’ve been a cause of iconoclastic losses twice, once in our own islands and once here. I’m walking through the city of Osnabrück thinking about all this when I’m caught up short by a jagged outline. This seems to be some too-cool-for-school modern building, in which everything is rather meretriciously at the wrong angle. It is. But it’s not. 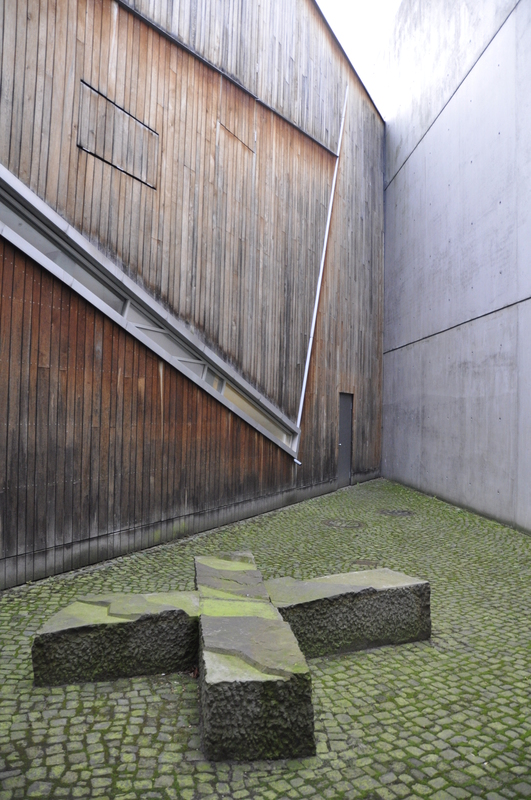 This is, apparently, Daniel Liebeskind’s first built work in Germany, a museum for the artists Felix Nusbaum. Even before I’ve entered, another wave of realisation hits me, again obvious but not digested until one’s walked the streets. There is another, more terrible kind of forgetting here: the kind of forgetting that is not to do with invented continuities but to do with invisible absences. Because, of course, all these cities had, along with all the layering and crumbling and hesitancy of real old places, a whole class of buildings that have vanished and not been replaced. Because there was no-one left to use them. Synagogues, mikvehs, Torah schools…. the architecture of an entire faith has been sucked from the landscape. We’re all familiar with the places of Holocaust: the death camps and labour camps and (today) memorials; what we forget is the non-places. The fact that all these millions of people came from somewhere, where ordinary Germans who happened to be Jewish, growing up in Osnabrück and Lübeck, Hamburg and Munster. It’s an odd thought that as we were piling east across these plains of birch and meadow, flattening town after town as we went, the Nazi murder machine was yet further east and at its height. One population crossing a landscape and leaving death in its wake even as another is sucked from that landscape and murdered wholesale. I’m not suggesting an equivalency between the Shoah and the German experience at the end of the war — a knowledge that the moral consquences, and indeed scale, of one event outshine the other tenfold is one of the reasons for the comparative silence about the latter — but both are traumas in which human beings suffered and, crucially for me, in which today’s places were made. And unmade. This is why this Nusbaum museum is so important. His was a remarkable story: a German-Jewish artist, fleeing to Belgium as so many did, put into a labour camp, escaped, made it to southern Europe, could have got on a boat to north Africa or England or America or wherever, but decided to go back to Belgium to get his wife. He must have known the likely consequences. He found her, they were hidden in an attic by friends — and, uniquely, they were provided there with studio space and the means to continue painting. So as the dark clouds closed in further and further, and local people where herded up on the streets and never came back, Nusbaum sat in his attic painting: creating real, conscious grown-up art — a teenage diary is one thing, this is quite another — that was a witness to these terrible times. And this was a choice: he didn’t have to be there at all. A more cowardly or selfish man would have ended up in New York and lived to see his stuff filling banker’s vestibules. Of course, he was found, and perished in Auschwitz, but the paintings he did survived. And then another remarkable vision took over: his relatives wanted them returned to the place of his birth, to be a witness that in a rational history he would have been a famous Osnabrück artist, a celebrated German painter, not a refugee. So this museum is a visionary attempt to respond to these vital absences: to put back into the landscape the lives that never should have left it, and while these lives are necessarily primarily of those who died in the Shoah they can stand in for all lives dislocated or terminated by war. And its building takes this challenging briefs and runs with it. This is an intense modernism-as-art. Only Baroque and Gothic at their best do more to manipulate, to create a building that is an act of discovery and understanding, to construct metaphor, to make the visitor an actor in a designed coup d’theatre. Its strange angles are deliberate: one wing points at distant Auschwitz, another to the site of Osnabrück synagogue. Entrances have gnomic dates and inscriptions on them, one is encouraged to explore locked doors — indeed interpreters need to be on hand to tell one the way forwards — to get lost. Sudden abysses and cut-off corridors embody the dislocations and unjust terminations of one individual’s life. Windows are angled to give significant glimpses; there is a void at the centre. This is the kind of placemaking that meets an impossible brief set by a history of recreations and disapperances, at once new and radical and deeply rooted. Of course, one couldn’t do this often: one couldn’t make a country out of buildings like this, and they wouldn’t be much good for working sleeping or shopping in. Nevertheless: the architectural challenge — to make places that at once embody and help one move forwards from one of the greatest crimes in human history — has been risen to, and that is an achievement in itself. And it’s more than just art: it s corporate act by one smallish city: finding a site, providing resources. Impressive indeed. Perhaps the equivalent challenge — to somehow remember, express, embody Germany’s own wartime experience — should be a long way behind this in the queue. Or perhaps this can stand for all German wartime traumas, Jewish or not. Or perhaps the whole thing should continue, unmentioned. Well, I think I mentioned it once, but I got away with it.